8.5” X 11” paper: Print 4 pages back-to-back and then fold in half for a booklet. 11” X 17” paper : Print 2 pages back-to-back; fold once the long way, and again the other way for a fold-out brochure. Would full-color hard copies of the Annual Report in Brief be useful for your group, service body, or event? 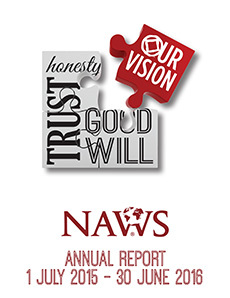 Email wb@na.org and we’ll do our best to provide copies, giving more members access to the NAWS Annual Report.